What Is Letter In Lacan’s Teaching ? What is letter in Lacan’s teaching ? ‒ if you pose the question in that way, you cannot find the answer because he doesn’t use the term “letter” univocally. In general he doesn’t care for univocality and coherence of his terminology because a psychoanalyst supposes always equivocality of what is uttered. On the contrary what is coherent and constant in Lacan’s teaching is the topology implied in Heidegger’s Denken des Seins (thinking of Being) on which Lacan is always based and which I call “apophatic ontology”. For example the first text of Lacan’s Ecrits “Seminar on The Purloined Letter” as well as that of his Autres écrits “Lituraterre” seem to concern letter. In the former, as I pointed out in my article “The Signifier Phallus in Lacan’s Teaching”, the purloined letter which can be found nowhere and which is “the veritable subject of the conte” is the barred subject $, i.e. 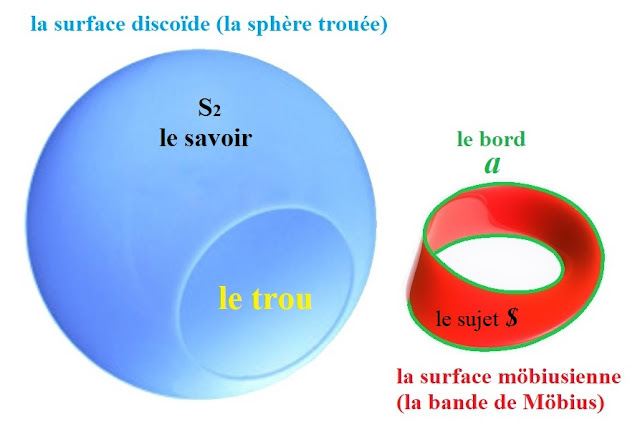 Being (Sein), situated in the locality of ex-sistence (Möbius surface, coloured red, in the topology of projective plane, cf. Fig 1). However in the latter Lacan says : “letter is more properly... littoral, isn’t it ? that is, it figures that an entire domain becomes a frontier for another domain in that those two domains are foreign to each other to such a degree as they are not reciprocal. Edge of the hole in the knowledge : that is what a letter draws” (La lettre n’est-elle pas... littoral plus proprement, soit figurant qu’un domaine tout entier fait pour un autre frontière, de ce qu’ils sont étrangers, jusqu’à n’être pas réciproques ? Le bord du trou dans le savoir, voilà-t-il pas ce qu’elle dessine : in Autres écrits, p.14). So we draw, as represented in the Fig. 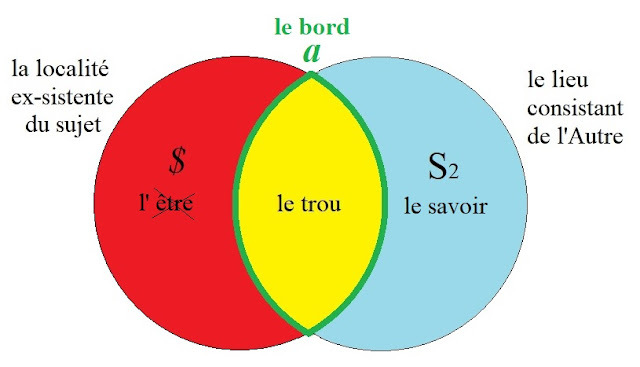 1 and 2, an edge (le bord : green) of a hole (le trou : yellow) on the surface of knowledge (le savoir : blue). 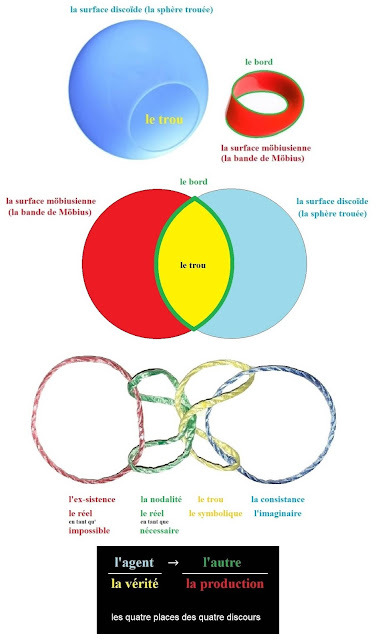 Möbius surface (red) represents the ex-sistent locality of Being (être, Sein) where the barred subject $ dwells. In the Fig. 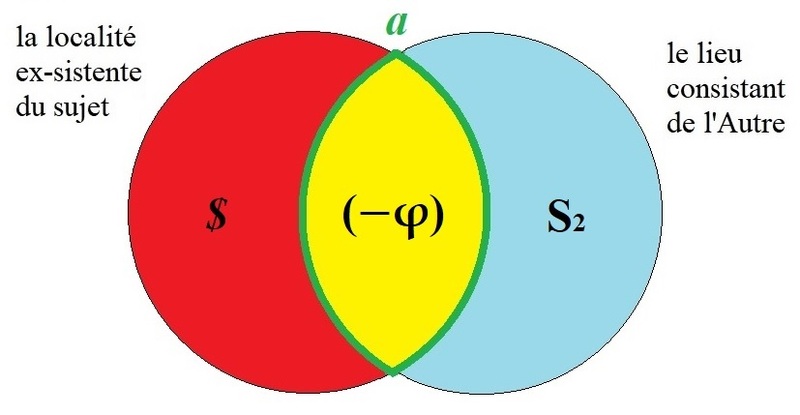 1 the edge is drawn as that of the Möbius surface (red), but on the projective plane formed by the identification of the edge of the hole of the discoid surface (blue) and that of the Möbius surface (red), the two surfaces have one and the same edge in common. The structure depicted by Lacan is that of the university discourse as the structure of alienation (cf. Fig. 3). The letter which makes the edge (green) of the hole (yellow) which I call “apophatico-ontological hole” and which opens on the surface of Other’s locus (blue) is the object a which is something material supporting the structure of the university discourse. When Lacan talks of “The Instance of Letter in Freudian Unconscious”, he talks of the letter as the object a in the university discourse. The right side part of the structure of the university discourse a / $ is the structure of what Lacan calls “formations of the unconscious” (formations de l’inconscient), for example dream, fantasy, various kinds of lapsus, Witz (wit, joke) and symptom. Certainly that object a is a letter, but not a phonogram like a Latin alphabet letter, but an ideogram like a character of hieroglyph or sinogram, as Freud says at the beginning of the chapter VI of his Dream Interpretation : “dream content [ what is given manifestly as images or representations in our dreams ] is presented to us as a translation of dream thought [ what is supposed to be a latent meaning of dream ] into another way of expression (...). Dream content is given, so to say, in an image-script (Bilderschrift) each sign of which can be translated into the language of dream thought”. Instead of signifier and letter Lacan uses some other terms like symbol, sign, cipher. In all of those what matters is the materiality a signifier or a letter can offer to the apophatico-ontological structure. His neologism lalangue introduced in the Seminar XIX ...ou pire (1971-1972) also denotes such materiality of signifier. It seems that, when we hear what is uttered, we understand immediately it in its meaning, but in fact it is not so, especially for psychoanalysts who abstain from understanding to keep open the possibility of interpretation. In the first place we hear fragments of lalangue in their materiality and in their equivocality or in their meaninglessness. Then we put them into letters (that is, interpret them) to notice that the way of transcription can be plural because they are equivocal or meaningless in themselves. Lacan gives us many examples of such fragments of lalangue : “a letter - a litter” of the Joycean circle, lettre - l’être, l’a-chose (la chose), y a d’l’Un (il y a de l’Un), a-mur (amour), les non-dupes errent (les Noms du Père), le sinthome (le saint homme, le symptôme), l’insu que sait de l’une-bévue s’aile à mourre (l’insuccès de l’Unbewußt c’est l’amour), etc. So on the occasion of his second trip to Japan in 1971 Lacan, sorry for Japanese translators of his Ecrits who can understand nothing of what he says or writes because they are not interested in psychoanalysis per se, declares nevertheless in front of them : “all depends on this : with what kind of ear you can read the things [ i.e. letters as fragments of lalangue you listen to ]”. Finally why interpret the letter (i.e. fragments of lalangue) which is situated in the structure of the university discourse as the object a representing the subject $ ? In order that the ununderstandable Bedeutung (significance) of the letter a ‒ i.e. the subject $ ‒ comes out from its place of hiddenness (Verborgenheit) into the place of unhiddenness (Unverborgenheit), because the purloined letter (la lettre en souffrance : $) desires to be delivered finally to the destination. S'il n’est digne d’Atrée, est digne de Thyeste. 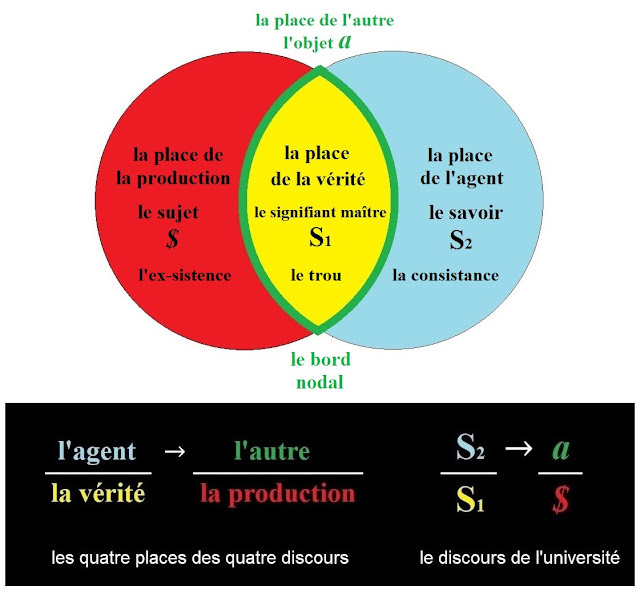 The Fig.4 represents the psychoanalytical process Lacan calls “progress” form the university discourse to the analyst discourse, where the subject $, hidden in the locality of ex-sistence (red) rises to the place of unhiddenness (green) to become the sublimated desire. It is this sublimated desire that Lacan calls “analyst’s desire” : the condition of possibility of psychoanalysis. This conclusion (Austrag) at the end of psychoanalysis corresponds also to what Heidegger calls Ereignis : the Being, fallen to be alienated in quotidianness, now separates itself from its alienating covering and opens itself out as Lichtung (clearing). In other words the Ereignis consists in assuming the most proper possibility of being ‒ i.e. the death ‒ not in the form of suicide but in endurance of death anxiety. Heidegger might have thought that the war would provide das Volk with a decisive opportunity of such trial. Instead, for us, our own experience of psychoanalysis will make us capable of enduring that extreme anxiety of Being. (...) the automatism of repetition (Wiederholungszwang) gets its principle in what we have called insistence of signifier chain. We have taken out this notion as correlative of the ex-sistence (that is, the eccentric place) where we must situate the subject of the unconscious (...). (...) it is in the experience inaugurated by psychoanalysis that we can seize by what mediation of the imaginary the grip of the symbolic can reach even into the most intimate place of human organism. There, in the first paragraph of the first text of his Ecrits, we can see how Lacan is formulating ‒ explicitly referring to Heidegger’s term “ex-sistence” (Ek-sistenz) ‒ the fundamental of his teaching : not the triad of the symbolic, the imaginary and the real, but the tetrad of the symbolic, the imaginary, the real as insistent repetition of what doesn’t cease to be written (necessary) and the real as ex-sistence of what doesn’t cease not to be written (impossible). 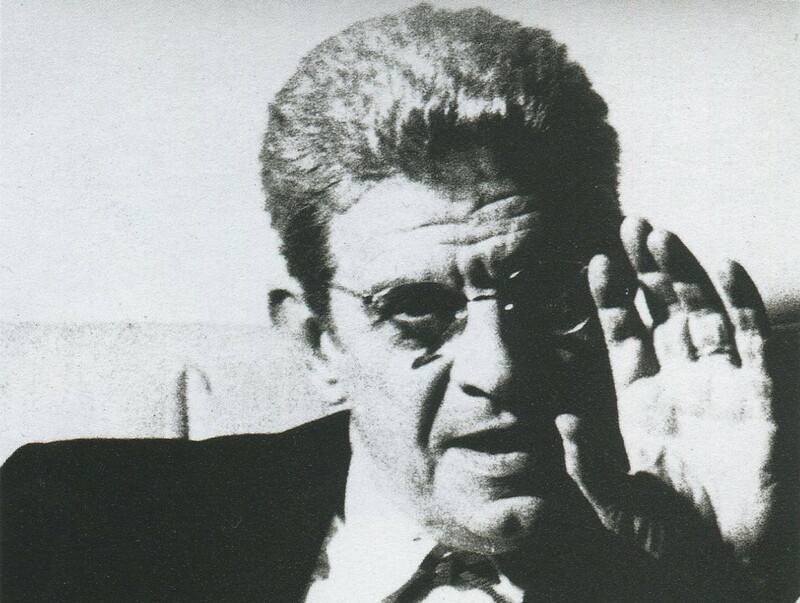 The entire teaching of Lacan is consisting in his effort to found psychoanalysis purely, i.e. non-empirically, with no reference to empirical sciences such as biology, psychology, sociology, etc. What he is referring to is : mathematical topologies of closed surfaces and Borromean knot, Hegel’s dialectic phenomenology and, as we’ve seen above, Heidegger’s thinking of Being (das Denken des Seyns). 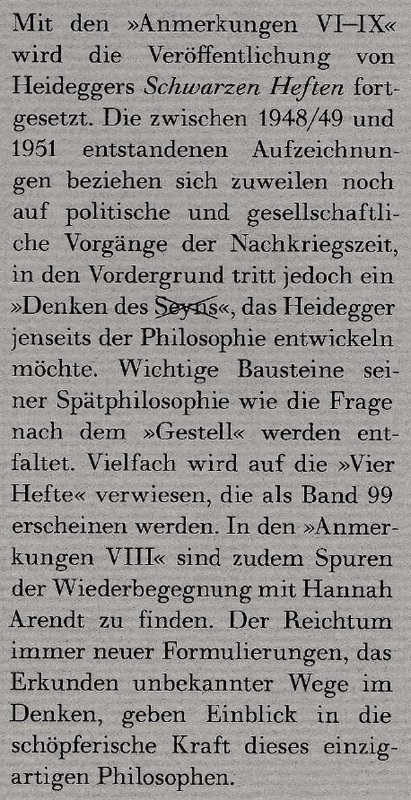 This formulation “das Denken des Seyns” with the word “Seyn” crossed out, which is Heidegger’s own expression, seems now to be recognised officially as emblematic of Heidegger’s après-guerre thinking because it is used in the editorial notice on the cover paper of the Gesamtausgabe 98 (the latest volume of his Schwarze Hefte). 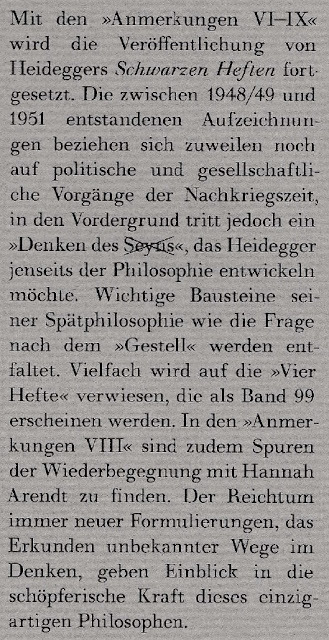 I estimate that it is very probable that Lacan invented his mathème of barred subject $ in 1958 out of Heidegger’s Sein which we can find only in one article published in his life time with the title : Zur Seinsfrage (1955, in GA 9). So in the mathème of barred subject $ we can see how Lacan was already aware in 1958 of the essential importance of thinking of Being in Heidegger’s teaching. I baptise this thinking of Being “apophatic ontology” after “apophatic theology” (negative theology) where God’s mysterious Being is kept outside the created world of things which are there. And I think the apophatic ontology and its topology are exactly what Lacan had in his conception as the pure foundation of psychoanalysis. 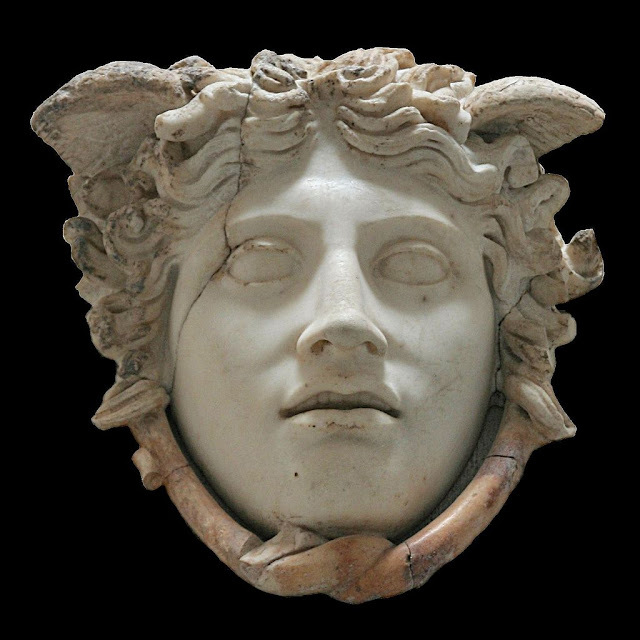 where we can find correspondence in the topology of projective plane, the structure of alienation, the topology of Borromean knot and the structures of the four discourses. the real as impossible ‒ ex-sistence ‒ das Sein (Being). On the basis of the apophatic ontology and its topology we can now make some elucidation on the problem of phallus in Lacan’s teaching. Because the person who posed me the question read already the Seminar on the Purloined Letter, I refer to that text. At the end of the session of the 10 March 1971 (the Seminar XVIII) Lacan says that when he talked of the purloined letter which can be found nowhere and which he calls “pure signifier” and “the veritable subject of the conte” he talked in fact of the phallus. That phallus is defined by Lacan as “signifier of lack-of-being” (signifiant du manque-à-être : in Ecrits, p.710). What Lacan calls “lack-of-being” (manque-à-être) is exactly Heidegger’s Sein (Being). The phallus φ, pure signifier of Being which can be found nowhere in the locus of Seiendes (things which are there), is what doesn’t cease not to be written, that is, the real as impossible. It can be found nowhere because its locality is ex-sistent to the locus of Seiendes. It is situated in the locality of ex-sistence (coloured red). because the S which is situated in the same place as φ in the schema R and which is the same S as in the schema L (Ecrits, p.53) denotes “the subject in its reality, foreclosed as such in the system and entering only under the mode of the dead in the signifier play but becoming the veritable subject as the signifier play lets it be signified” (le sujet dans sa réalité, comme telle forclose dans le système et n’entrant que sous le mode du mort dans le jeu des signifiants, mais devenant le sujet véritable à mesure que ce jeu des signifiants va le faire signifier : in Ecrits, p.551), that is, the S in those schemata is in fact the barred subject $ in the ex-sistent locality of Being (Sein), and correspondingly the φ too. 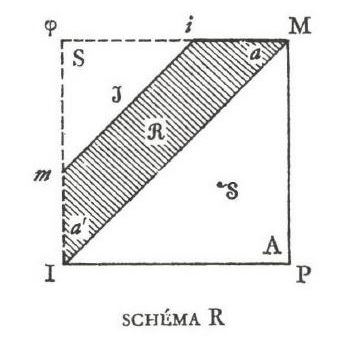 We can add a remark : if in the schema R what is the real (the real as impossible) is the S and the φ situated at the upper left angle, what is the central zone R ? It is : the real as necessary (what doesn’t cease to be written) of symptoms. We can see also there the tetradic structure implied in Lacan’s teaching. There is another phallus which Lacan denotes with the mathème ( − φ ) [ minus phi ] and defines as “imaginary function of castration” (fonction imaginaire de la castration . in Ecrits, p.825), in other words : imaginary correlate of castration. 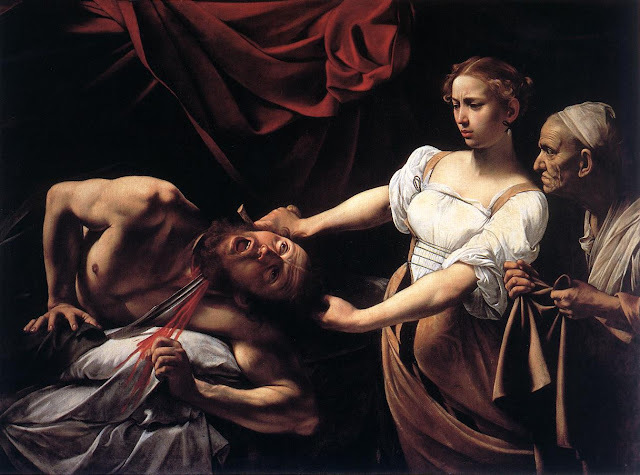 The castration complex concerns the anxiety in front of the hole of lack-of-being which opens up in Other’s locus (le lieu de l’Autre) as mother’s body. The phallus ( − φ ) is a hallucination of lack of phallus at the hole of lack-of-being in Other’s locus. We can say it’s a sort of hallucination because one sees a lack of phallus in place of nothing which can be found at the hole (coloured yellow). where the symbole Ø denotes negation. where the formula ($x) Φ(x) denotes the ex-sistence of the patriarchal phallus (the phallus of the Urvater in Freud’s myth of primitive tribe) in the place of truth (coloured yellow). 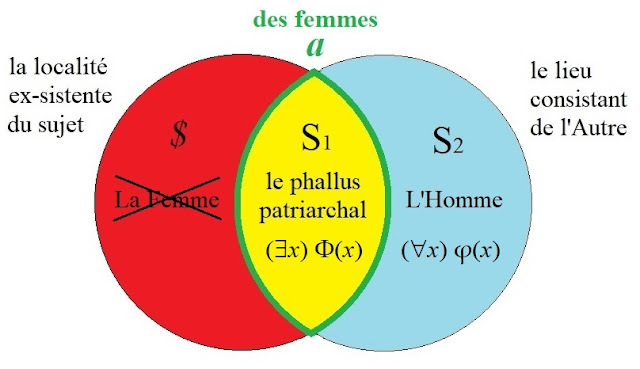 This schema means : there can be the sexual relationship by means of the patriarchal phallus Φ : “the symbolic phallus, impossible to negativate, signifier of jouissance” (le phallus symbolique, impossible à négativer, signifiant de la jouissance : Ecrits, p.823). This patriarchal phallus Φ is the male ego-ideal, the identification to which defines the condition of being a man, which condition is formalised as φ(x). 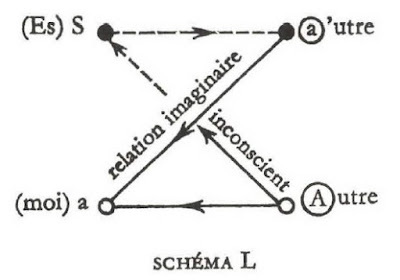 Lacan’s formula : “there is no sexual relationship” (il n’y a pas de rapport sexuel) says this : the patriarchal phallus Φ is only a paranoiac fiction denying the impossible phallus φ . The fact is : there is nothing in the place of truth occupied by the S1 in the structure of alienation. The place of truth in the four discourses is nothing but the hole in the apophatico-ontologic topology. From Heidegger’s History of Being (Geschichte des Seyns) we could say that the paranoiac belief of the ex-sistence of S1 (e.g. τὸ ὄντως ὄν, ἰδέα, οὐσία, essentia, substantia, the God of philosophers and theologians, conatus, Wille zur Macht, Übermensch, etc.) which obturates the apophatico-ontologic hole determines metaphysics. Now there should remain nothing like such metaphysical delusions anymore, nor the patriarchal phallus Φ the identification to which has been the determinant of the “being a man” in the History of Sexuality. Philosophers could declare the end of metaphysics. Perhaps an abolition of that paranoia of very long duration ‒ metaphysics and patriarchalism ‒ can be achieved only in one’s own experience of psychoanalysis. L’hospitalité reçue de l’École normale supérieure, un auditoire très accru indiquaient un changement de front de notre discours. Pendant dix ans, il avait été dosé aux capacités de spécialistes ; sans doute seuls témoins recevables de l’action par excellence que leur propose la psychanalyse, mais, aussi bien, que les conditions de leur recrutement laissent très fermés à l’ordre dialectique qui gouverne cette action. Nous avons mis au point un ὄργανον à leur usage, en l’émettant selon une propédeutique qui n’en avançait aucun étage avant qu’ils aient pu mesurer le bien-fondé du précédent. C’est la présentation que nous devions renverser, nous parut-il, trouvant dans la crise moins l’occasion d’une synthèse que le devoir d’éclairer l’abrupt du réel que nous restaurions dans le champ légué par Freud à nos soins. Bien loin d’être une réduction hégélienne de ce réel (sinon pour le réaffirmer comme rationnel), notre effort avait donné son statut à la subversion produite dans le sujet du savoir. Notre exposé de cette année choisissait les quatre concepts qui jouent dans cette subversion une fonction originante : l’inconscient, la répétition, le transfert, la pulsion ‒ pour les redéfinir chacun et les montrer noués par la topologie qui les soutient en une fonction commune. Permanente donc restait la question qui fait notre projet radical : celle qui va de : la psychanalyse est-elle une science ? à : qu’est-ce qu’une science qui inclut la psychanalyse ? L’inconscient maintenu selon notre propos inaugural comme effet de signifiant, et structuré comme un langage, fut ici repris comme pulsation temporelle. Dans la répétition fut mise au jour la fonction de τύχη qui s’abrite derrière son aspect d’αὐτόματον : le manque à la rencontre ici s’isole comme rapport au réel. Le transfert comme temps de fermeture lié à la tromperie de l’amour, s’intégrait à cette pulsation. De la pulsion nous donnâmes une théorie qui, en cette miannée 65 où soudain l’on nous presse de livrer ce résumé, n’a pu encore être démarquée. 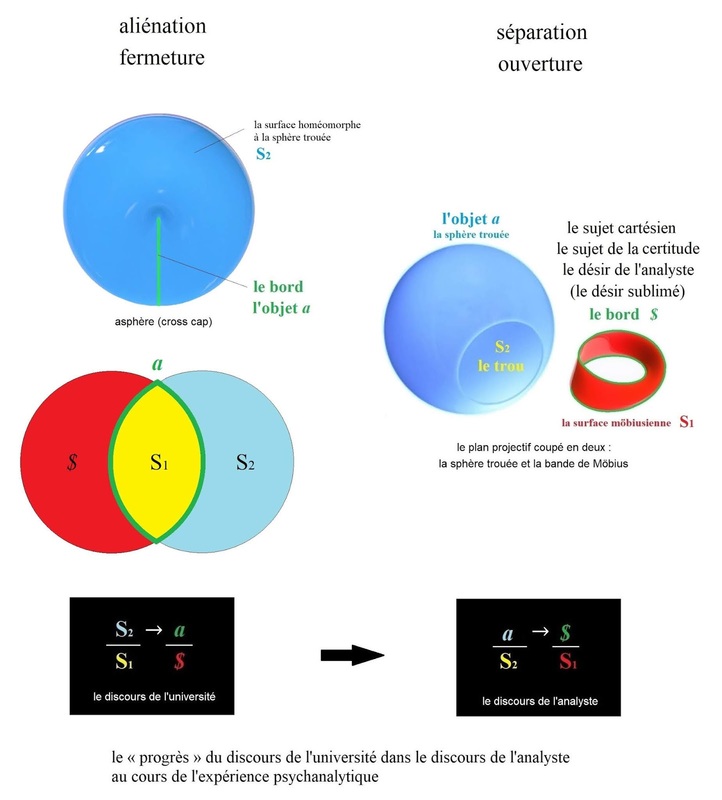 Raison de sa constance, topologie dite de bord, expliquant le privilège des orifices, statut d’action en retour, dissociation du but et de l’objet, sont ici apparus pour la première fois. Ce tableau de chasse ne dit pas les contours nécessaires à assurer un tel noeud, ni ce qu’il enserre. Nous y marquâmes une fois de plus la préemption du sujet cartésien en tant qu’il se distingue du sujet de la connaissance comme sujet de la certitude - et comment, revalorisé par l’inconscient, il passe au rang de préalable de l’action psychanalytique. De même, la pulsion scopique, pour nous servir de paradigme, reçut-elle un développement particulier. Y démontrer l’antinomie de la vision et du regard avait le but d’y atteindre le registre, fondamental pour la pensée de Freud, de l’objet perdu. Cet objet, nous l’avons formulé comme la cause de cette position du sujet que subordonne le fantasme. Mais la parution simultanée, en une récollation pieuse, de l’oeuvre Le Visible et l’Invisible, où s’interrompait à l’heure même de son avènement la conversion manifeste de l’interrogation de Merleau-Ponty, devait nous solliciter de marquer la priorité qui revient aux traits structuraux, dans tout essai d’atteinte ontique. Nous en suspendîmes l’approche, tout en annonçant les « positions subjectives de l’être » pour l’année à venir. On lira avec le temps les limites où nous avons fait rentrer, par l’implication de nos dires, l’effet de relâchement subi par notre thématique à mesure d’une diffusion qui fut notre surprise à ce tournant. Cette correction intéresse le sort de tout ce qui se rallie, trop largement maintenant, sous l’enseigne du structuralisme. Une fois de plus s’y confirme, dans le progrès de la science, la corrélation éthique dont la psychanalyse a les clefs, et dont le sort donc est précaire. C’est pourquoi notre dernier temps est revenu à un fondement de grande logique, en remettant en cause sur la base de ce lieu du Grand Autre, promu par nous comme constituant du sujet, la notion, avilie par l’à-vau-l’eau de la critique politique, de l’aliénation.